I wrote an article about George Guest for Clocks Magazine published in the issue for March 1986, but since then one or two other clocks have come to light by this intriguing maker. George Robey also wrote an article in Clocks about a longcase clock by him in July 1997. But now another longcase clock by him has come to light, and one which poses some interesting questions, so I thought it would be worth looking again at the background of this intriguing maker. We know he was baptised at St. Martin's Birmingham on the 24th August 1658, the son of George Guest senior. George had an older sister, Elizabeth, born in 1656. His mother was called Joan, but the marriage of the parents has not been traced. George senior died in 1676, buried at St. Martin's, which seems to have been he church the family always used, on the 21stFebruary 1675/76. In 1674 George senior seems to have purchased some land and tenements in Birmingham from Thomas Greene and his wife, Alice. The change of circumstance with George's death appears to have forced his widow to sell the land and various documents survive dated 1681 and 1682 regarding the sale of part of a property in Bull Street, Birmingham, by Joan Guest and her son, George, to George Abell or Abdell, a saddler. In one of these documents George junior is described as a locksmith, which was perhaps the trade he had been trained in. It was George junior who became a clockmaker. It may have been following the sale of the Birmingham premises that George moved to Aston, for that is where he worked when we next hear of him. His first wife, Anne, was buried at Aston on the 14th April 1702, described as the wife of George Guest of Yardley. Aston and Yardley are now suburbs of Birmingham. And it was at Yardley that George married for a second time on the 2nd May 1703 to Sarah Kimberley. If he lived at Yardley it must have been only briefly as his clocks are signed at Aston not Yardley, at least no example has yet been recorded signed at Yardley. His earliest clocks, of which only two seem to be known, a lantern clock and a thirty-hour longcase, are signed 'Georgius Guest fecit'. His later clocks, of which three eight-day examples are known, are signed at Aston as 'Geo. Guest Aston'. 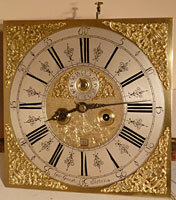 Thirteen inch dial of a longcase clock of about 1710-20 by'Geo Guest Aston'. The dial is pictured after cleaning. Original steel hands. The tiny spandrels beside the seconds dial were used by a few northern and western clockmakers about this time. Click for closer view. I have been able to find no children born to either of George's marriages, though it may simply be that any baptisms have eluded me. Nor have I found his first marriage. However although his first wife was buried at Aston, his second wife, Sarah, was buried at St Martin's Birmingham on the 28th August 1711. The burial of George himself was also at St. Martin's on the 3rd November 1712. Why would his first wife be buried at Aston, when he and his second wife were buried in the church the family had formerly used, being St. Martin's Birmingham? Well perhaps his first wife was from Aston and she was buried back at her old 'home' church, a practice not unknown at this time to sort of keep the family together in death if not in life. It may be relevant that I could not find the burial of his mother, Joan Guest, which was not at the family church of St. Martin's in Birmingham nor at Aston. Had she too perhaps been buried back in her own village of origin, to us an unknown location? I was keen to try to discover if George had any children, but I could find no evidence of any. The reason is that some features of two of his eight-day clocks seem by their style to date from perhaps 1720 or even a little later. For instance the tiny spandrels by the seconds dial, the double-eagle corner spandrels on that dial. Yet we know George died in 1712. Could it be that our dating by style is slightly out - which after all is only dating by an intelligent guess based on experience. Could it be that these features were in use as early as 1712? Well, yes it could, but I tried nevertheless to search for any signs of a further, third George Guest, a possible son of the clockmaker who died in 1712. But without success. The movement of the clock has finely knopped and finned pillars. It has rack striking, just now coming into use in longcase clocks. Click for closer view. Well, oddly enough it was the right couple, because back at Holy Trinity Coventry there followed the baptism of their children: 1698 Samuel, 1701 John, 1704 Thomas, 1707 Elizabeth, 1710 Ann, 1712 William. Then Samuel Moy married for the second time, implying the death of his wife, Catherine (Kimberley), though I could not find her burial. So they went off to marry at distance then immediately came back home and settled down to rearing a family. But what possessed twenty-two-year-old Catherine Kimberley to marry Samuel Moy, who was apparently from a local Coventry family, all that vast distance from home? Was it a runaway marriage, as the couple eloped to escape parental objection? The fielded panel style replaces the earlier lenticle glass. The caddy top was one option on a square dial clock. Click for closer view. Searching at Sheen parish produced an interesting result. There was a Joseph Kimberley living there with his wife, Eleanor, and they had two children baptised there: Elizabeth in October 1695 and Joseph in January 1697. So they were there when Catherine and Samuel came to the parish to marry. Joseph must surely have been a relative of Catherine. I could not trace him as a brother but found some evidence suggesting that he may have been her uncle. So it looks as if the sister of George Guest's second wife, Sarah, ran off to marry in a distant parish under the watchful eye of a relative (her uncle Joseph?) and the only reason I can think of was the hostility of her parents towards her chosen groom, Samuel Moy. Fascinating though this was, it led to no further discovery about George Guest himself. One further piece of evidence came to light during the search. We have seen that George's wife, Sarah (nee Kimberley) was buried at St. Martin's Birmingham in 1711 and George himself in 1712. On the 8th March 1712/13 there was the burial there of William Kimberley. Could he be the father of Sarah (and Catherine) who had moved to be with his daughter and son-in-law in old age and outlived them both? Well it is perhaps only a possibility. The hood still has the early features of pillars attached to the door and glass side windows. A pierced fret lets out the sound of the bell and is a feature of many early clocks. Click for closer view. Another item I came across is fascinating - a marriage settlement of 1733 of Elizabeth Guest of Birmingham concerning property in Bull Street, Birmingham, the very street where George Guest's family had owned a property in the 1670s and 1680s. Who on earth was this Elizabeth Guest? But by now I had been on enough wild goose chases, enthralling though they may be. Sarah Kimberley's father, William of Coventry had married Elizabeth Sadler at Fillongley in Warwickshire, in 1674 and their daughter, Sarah, was born in 1673 - or so the records say but transcripts of records often get the year wrong by one. Why would William Kimberley, a Coventry man, marry at Fillongley ten miles away? The church clock at Fillongley was made in 1668 by clockmaker John Sadler of nearby Coleshill. Could Elizabeth Sadler be related to clockmaker John Sadler, implying that William Kimberley went to marry her in her local parish and was also in a related trade, which could be how George Guest met Sarah? Oh dear ... more tangents. In the end I now know more about George Guest than I did at the start. But I have not been able to resolve the intriguing question as to whether George's clocks show an earlier use of spandrels than we expected, thus revising our thinking a little on stylistic features, or whether George had a son named George, who followed his father in the trade - and left no trace of his having existed. There is always more to be searched for.